A couple thousand years ago, these words were uttered by Jesus Christ Himself, "In this world you will have trouble. But take heart; I have overcome the world." The truth is, this world is full of hardship and heartache. But the other side of the coin is that Christ has overcome. And not only in the eternal salvation sense, although certainly that gives cause for great rejoicing, but in the sense that He can use our painful circumstances to bend our hearts toward Him and grant us the peace that passes all understanding. I believe there is great worth in sharing our trials and the truths the Lord revealed about Himself as a result of walking us through that trial. 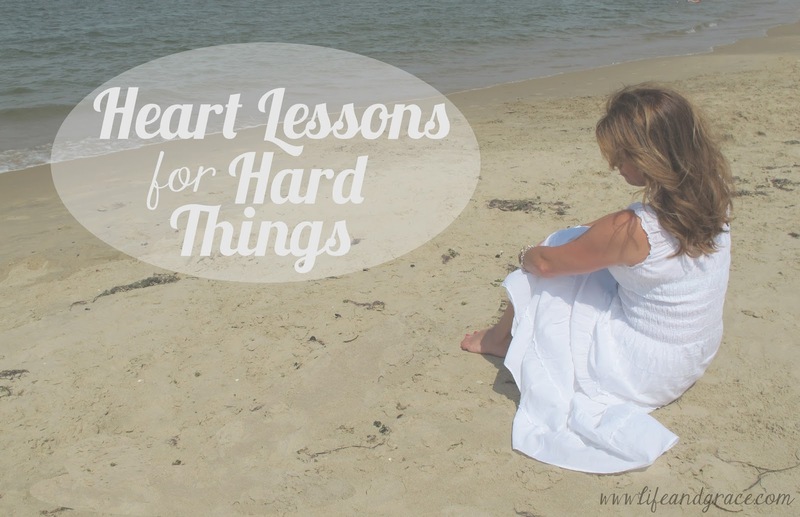 And so, that is what Heart Lessons for Hard Things is about - a running series on this blog where some really wonderful people will share what the Lord taught them while He led them down a very rocky path. My prayer is that we will all be blessed by what is shared here. If you would like to share a Heart Lesson, please email it, with a picture, to sarahjrieke@gmail.com. The Love of Our Father, by Rachel L.
This is a wonderful idea for a series Sarah :) I look forward to reading them.